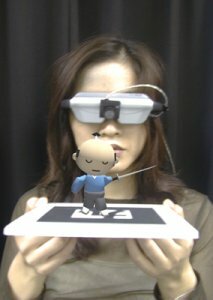 The ARToolkit http://www.hitl.washington.edu/artoolkit/ is a "library for building Augmented Reality (AR) applications. These are applications that involve the overlay of virtual imagery on the real world." Using camera-tracked marker cards as shown in the image below, a virtual character can be superimposed with correct apparent position and orientation into the original video image. I too am trying to get this working. I thought I'd write up my experiences as I went along, perhaps moving it over to a Wiki page if and when the remaining bugs are worked out. However, rather than use the ARToolkit, I'm instead using ARToolkitPlus (http://studierstube.icg.tu-graz.ac.at/h ... itplus.php ), an optimized version of the former that, in addition to providing a C++ interface, purportedly has a better pose estimator. The downside is that ARToolkitPlus has absolutely no support and doesn't include camera capture functionality. You need to have a separate means of obtaining the camera image data. - installed ARToolkit (original) and ran the included demo applications. - used the ARToolkit's calibration programs to obtain a camera calibration file specific to my Logitech QuickCam Orbit (ARToolkitPlus is able to read these calibration files). - ARToolkitPlus comes with a simple test application and sample image. I confirmed that the test image is "trackable". - printed out my own marker (from the ARToolkitPlus), glued it to a piece of cardboard, captured a frame from my webcam and hacked the demo app to check that I could "track" this single image. - To bring the webcam images into Ogre. I used Timme's plug-in, http://www.ogre3d.org/phpBB2/viewtopic.php?t=16572. It offers notification of a new frame's arrival via a listener class. It's in this listener class constructor that I instantiate the ARToolkitPlus, and the "new frame" method that I search for the marker card. - Combined, I now have a simple Ogre application with the webcam showing up as a background (see http://www.ogre3d.org/wiki/index.php/Di ... ackgrounds) and a small test mesh being moved around based on calculations coming from ARToolkitPlus. As we move the marker tile around now, the cube should track its centre. What I find though is that the y coordinate tracks fine but that there is a discrepency in the horizontal position. Video (DivX, 2.5Mb) of the result can be found http://www.edmstudio.com/ogre/06G19-art ... lation.avi. Part of the mismatch is coming from ARToolkitPlus. The following image shows the marker tile held at the position that gives (x,y) coordinates of (0,0). The red dot is where Ogre renders the test cube (0,0,-1.66). Note the horizontal difference between the middle of the marker tile and the image centre (white lines). I'm guessing that this is a camera calibration issue - though why (0,0) is offset from the image centre is strange. The results are shown in this video (DivX, 2.5Mb) http://www.edmstudio.com/ogre/06G19-art ... tation.avi with an image still shown below. Last edited by futnuh on Fri Jul 21, 2006 6:54 am, edited 5 times in total. Rotations are working now as you can see in this video (DivX, 2Mb), http://www.edmstudio.com/ogre/06G20-art ... ations.avi. I realized that while ARToolkit and Ogre both use right-handed coordinate systems, there was a 180 degree Y rotation needed to bring things into alignment. Question: is this possible via selected sign changes in the matrix elements? You can't just arbitrarily negate x (or y or z) as this changes the handedness of your orthonormal basis - and you get strange scaling effects as the object turns. anyway, hope you get all the problems sorted out, keep us updated on your progress! what equipment do you need for it? I've done some AR work using ARToolkit as well, but this was before I started learning Ogre. I'd be interested in following your progress. As far as your camera calibration error goes, are you using any of ARToolkit's camera calibration code? Webcams tend to have some pretty mean distortion, so manual measurements probably will not cut it. Chris Jones wrote: what equipment do you need for it? Just a webcam and a printer for making the marker tiles. Biomass wrote: As far as your camera calibration error goes, are you using any of ARToolkit's camera calibration code? Once I've got the bugs worked out and something other than a simple cube, I'll clean up the source and put it online along with a Windows distro for people to try. First of all sorry for my English, it's not very good. I have implemented ARToolkit and modified it for my project purpouse. But now I need a powerful engine, so I've decided to use Ogre. The problem is that I don't know how to "link" OpenCV with ARToolkit video capture (while OpenCV uses IPLIMAGE, ARToolkit uses ARuint8) and I don't know exactly where to call the method that recognize the markers. Please, could you explain a little more how did you solve this problems? Sylpheed wrote: I have implemented ARToolkit and modified it for my project purpouse. But now I need a powerful engine, so I've decided to use Ogre. The problem is that I don't know how to "link" OpenCV with ARToolkit video capture (while OpenCV uses IPLIMAGE, ARToolkit uses ARuint8) and I don't know exactly where to call the method that recognize the markers. Please, could you explain a little more how did you solve this problems? I'll try and bundle up the source of my simple demo app today or tomorrow. futnuh wrote: I'll try and bundle up the source of my simple demo app today or tomorrow. Thanks a lot dude I appreciate your help so much, I'm at work and I get scared a little with Ogre and OpenCV (is the first time I code in a 3D engine). so could I call ARTollkit's marker detection with that rawdata? is rawdata the same image structure than ARUint8? Sorry, I'm a noob as a coder Thanks a lot for your answer. Sylpheed wrote: is rawdata the same image structure than ARUint8? Without looking at the source, I'm guessing yes. And as they are both single byte, the worst that will happen will be an unrecognizable image. Many years ago I phoned tech support for an unnamed volume visualization program. Their program was crashing when importing one of our 128^3 data sets of raw byte data (no header). The tech support guy tried to claim that I had a malformed dataset: he just couldn't understand that as long as the file size was correct, I definitely had a dataset of "something". For anyone following this thread, I have been struggling over the past few days trying to understand why the ARToolkitPlus' RPP pose estimator occasionally yields zero'd modelview matrices and eventual locks up requiring me to kill the process (ctrl-c in my cygwin terminal). I've created a little demo app that exhibits the behaviour on two of my machines, but not on the toolkit author's machine overseas. If you are an XP user and can spare a few minutes, please take a look at http://www.ogre3d.org/phpBB2/viewtopic. ... 974#166974. When I arrive at home I will try the link you've posted and I will post the result. - OpenCV shows the image horizontal mirrored, and I don't know why! I haven't modified the original source code from OpenCV. - I have an error when I try to open my camera_parameter.dat. I have to use the cameraparams.dat from futnuh source code! How could I build my working camera_param.dat? I used the the 2 steps to calibrate my webcam (Logitech messenger webcam), should I use only one step? - And now the most important thing, the position and rotation of the object. When I move the marker, the object doesn't move. I set the orientation and position of the object with the function getModelViewMatrix, but it doesn't work, the object doesn't move, but it rotates at least. Have I to set the orientation and position of the camera instead of the object?? Sylpheed wrote: OpenCV shows the image horizontal mirrored, and I don't know why! I haven't modified the original source code from OpenCV. Is the ARToolkit detecting your marker and returning a non-zero modelview matrix? I.e., markers are detected but the image in Ogre is showing up flipped? In this case, use a "scale -1 1" in your material file to flip the texture on the screen. If the marker isn't detected, you'll need to flip the image using the cvFlip() routine. Alternatively, your camera driver might allow you to toggle horizontal flip. Sylpheed wrote: I have an error when I try to open my camera_parameter.dat. I have to use the cameraparams.dat from futnuh source code! How could I build my working camera_param.dat? I used the the 2 steps to calibrate my webcam (Logitech messenger webcam), should I use only one step? I am using "camera_calib2.exe" from the ARToolkit. Sylpheed wrote: When I move the marker, the object doesn't move. I set the orientation and position of the object with the function getModelViewMatrix, but it doesn't work, the object doesn't move, but it rotates at least. Have I to set the orientation and position of the camera instead of the object?? I'm not sure if ARToolkit's getModelView matrix function is in OpenGL format or not. Print out the raw matrix and your position vector. Does the position make sense? You might need to choose different matrix elements instead. Finally, you set the camera or the object depending on the application. For a fixed camera and moving marker, it makes more sense to move the object. Thanks futnuh, you are awesome! Things are going OK, I had some problems with the position, but it was because I forgot to change the size of the pattern. Now I'm confused because the framerate is under 10 fps. It's due to the function "calc", if I quit that line the framerate going up to 40 fps. Anybody know why?? Sylpheed wrote: Thanks futnuh, you are awesome! I think you need to renormalize your praise. For future reference, I am a happy but middling hacker. Sinbad is awesome. As was Gandhi. Sylpheed wrote: Now I'm confused because the framerate is under 10 fps. It's due to the function "calc", if I quit that line the framerate going up to 40 fps. Anybody know why?? Well, the calc routine is where all the hard work is done. There is a fair amount of iterative solving going on underneath to come up with the final modelview matrix. That said, I've read people being able to increase performance by 100% by improving the camera calibration. Also, you'll probably want to move the 'calc' call into the same thread that is capturing your camera image. That way, when Ogre gets told about a new frame, the calculation has already been done. You're right futnuh, it is the camera calibration . Now it works perfectly, near 50 fps. The next step is translate the object one pattern to other at a certain speed (for example, 0.1 units per frame). I implemented all of this functions in ARTooKit, but I couldn't import 3D Studio Max animations in OpenGL, so I had to use a 3D Engine (everybody agrees Ogre is the best free 3D Engine). The coding is becoming difficult due to my ignorance in OpenCV and Ogre's API. Wow, nice work futnuh. I've been following the development of the ARToolkit since it was released, though I haven't got around to playing with it yet. Its nice to see that some people, like yourself, are expanding the uses of the platform and pushing the envelope. Please keep updating this project, its looking really good. Instead of making it frame based, I'd suggest using relative time. Decide how long you want it to take for the object to jump from one marker to another. Then start interpolating the position and orientation (the latter using quaternion lerp or slerp - see the Ogre API). Every time a new webcam frame comes in, you'll have to adjust your target. In between these, Ogre will move your object towards the last known target position. That's a good idea, but what happens if the target gets moved? The object would move faster or slower if the target go further or nearer from its original position. 1 - The object is positioned on the source. 3 - In the next frame, the camera still aims to the target, so we have to move the object. But before that, we have to re-positionate the object, because the camera could be moved from its original position. So all we have to do is get the actual position of the target and then we force the object to keep the same distance with the target in the previous frame(in the example, the 15 units). Once the object is positioned, we can move it. For the speed of the object I use a constant and the distance from the object to the target of the three axes. nice to see that you got your project working . Good work! May I ask you, for what will you use the ARToolkit in future? Will it replace the gyroscopic mouse and you will be able to manipulate the "sliceable head" with your hands? @Sylpheed: Are you using the OpenGL Subsystem for rendering? I have an ATI graphic card (Radeon 9600XT) and the texture with the web cam image is corrupt since the plugin is compiled against Dagon. Do you have this problem, too? For now I couldn't solve that problem. Timme wrote: Are you using the OpenGL Subsystem for rendering? Not, I'm using DirectX Subsystem. I can see nothing with openGL subsystem, the rendering window shows the grey color for the background, so I have to use Directx. I've actually been wanting to do this (positioning, orienting with markers) for some months since I saw a small demo at CeBIT. I thought it would be cool to use this in Ogre, and now you've paved the way. I didn't know that ARToolkit could do this. That's pretty cool. Timme wrote: May I ask you, for what will you use the ARToolkit in future? We are pitching a number of projects to a few potential clients . One idea, for example, would be an agricultural exhibit where children grow a virtual plant on their personal marker. By going to different stations, they can use virtual tools (that replace the AR markers) to add sunshine, nitrogen, moisture etc. Right now I'm just trying to build a compelling demo to showcase the possibilities. Note that the ARToolkit is GPL rather than LGPL. For commercial use though, the ARToolkit people have very reasonable licensing terms - see their page for contact details.